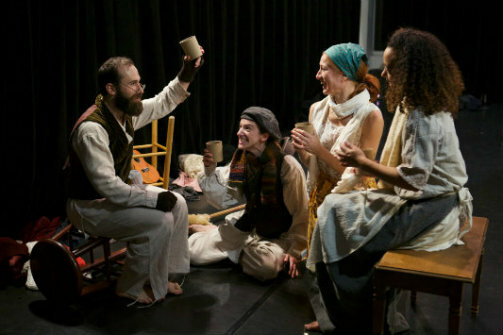 Nathan Richard Wagner, Becca Schneider, Tatyana Kot, and Claire Fort in A Christmas Carol. Photo by Alan Roche. BOTTOM LINE: Blessed Unrest's A Christmas Carol comes around again for a victory lap, perhaps a little out of shape. Jessica Burr and Blessed Unrest's gifted ensemble have created some of the most engaging, dangerous, creative new work in the city. Their work is always athletic, always intelligent—and up to this point, I would have said always polished. This production of A Christmas Carol, however, appears to have gathered some dust in the years since it was first staged at Interart Theatre in 2013. Jessica Burr's habitual style requires an extreme attention to choreography that creates a seamless flow from scene to scene. It's what allows Blessed Unrest actors to pop in and out of multilayered, metatheatrical worlds without muddying the waters, as in 2014's Lying and 2016's Body: Anatomies of Being. The team's rigorous attention to physical expression frees the mind. In this staging of A Christmas Carol, some elements of the performance still shine—Becca Schneider and Nathan Richard Wagner are particularly charming in all their roles. The scenic tricks surrounding a detached door and a large white sheet make a somewhat bare playing space work for the company. Costumes are different period pieces added to a standard underlayer of Victorian undergarments worn by every cast member, and are an interesting, functional way of helping the actors play so many roles in a short span. Yet the careful choreographed flow of the piece itself is somewhat muddy after three years on the shelf, and this makes a big difference for a Blessed Unrest show. Actors lag and stumble as they sluggishly remember (or in the case of new cast members J. Stephen Brantley, Claire Fort, and Becca Schneider, step into) the blocking and swooping scene setting that drives the action. Sluggishness means slow scene transitions, which lead to quite a few aimless moments of costume-donning and furniture-pushing that left me confused: is this meant to be a "moment," or are they just having trouble with the sleeves and the stair effect? The result is a piece that seems to lag as well, justifying the curmudgeonliness of the most famous penny-pincher in English literature. Instead of quick jabs of revelation, the audience is subjected to the slow burn of brooding as the three Christmas ghosts lead us into Scrooge's mind, and watch him realize that for reasons X, Y, and Z, the only way for him not to die alone is to start giving some of that cash away. Other sections explaining the social conditions in Scrooge's world, like the Cratchits' struggles with affordable healthcare, lean toward the melodramatic-Shavian at their current pace, which is not a fun place to be as an audience member. Portraying the moral development of an individual philanthropist is perhaps more relevant now than it was in 2013, as a small group of individuals command more and more of our country's private capital, and federal assistance programs are threatened. Still, the piece needs a few more runs before it will draw complete sympathy for Scrooge again. A Christmas Carol is adapted by Matt Opatrny from the book by Charles Dickens. Directed and Choreographed by Jessica Burr. Set/Prop Design is by Matt Opatrny & Neal Wilkinson. Scenic Artist is Jessie Mahon. Lighting Design is by Jay Ryan. Sound Design is by Sam Kusnetz & Beth Lake. Costume Design is by Summer Lee Jack & Rebecca Welles. Production Stage Manager is Darielle Shandler. The cast is J. Stephen Brantley, Claire Fort, Tatyana Kot, Nancy Monahan, Becca Schneider, Nathan Richard Wagner, and Joshua Wynter.